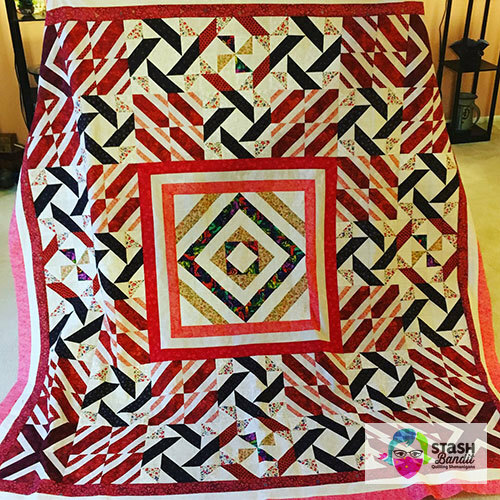 One of the first programs I developed for quilt guilds is called One Hundred Small Quilts. 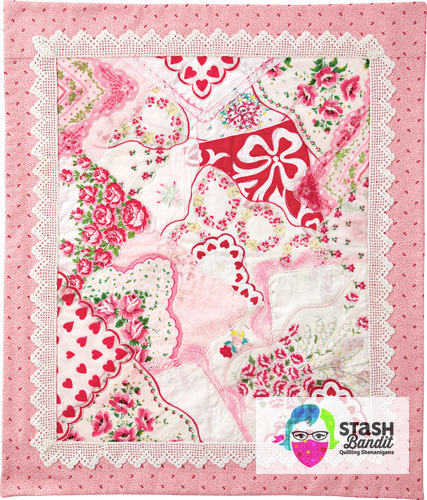 I’m presenting these quilts in a series of short posts on Stash Bandit. Our assignment was to use line (and not much else) to create our design. 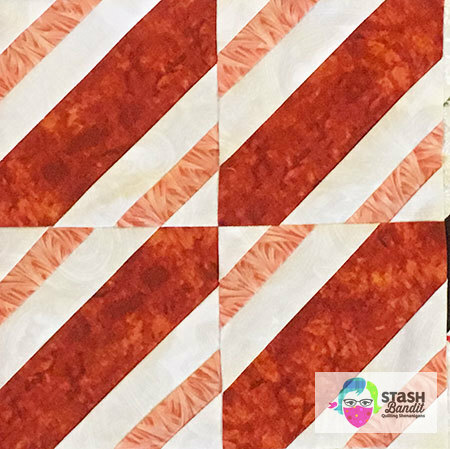 I had these hand-dyed fabrics from Cherrywood which were all similar in value, so I used those for the background. I had ombré fabrics in similar colors with a splash of yellow, which I used for the appliqued bars. 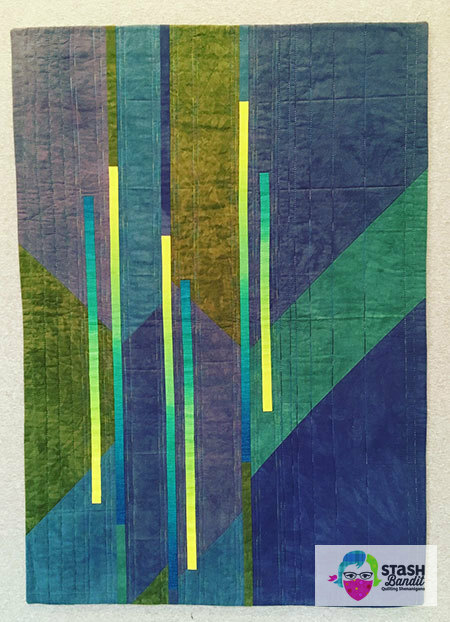 I enjoyed playing with variegated thread for the quilting. My Bernina has a straight stitch that goes over itself a second time for a stronger line, which is what you see on the left above and on the right below. For me, it’s often about experimenting to see what works. I do end up taking things out or taking them apart when they don’t work. But if I was never willing to play around to see what would happen, I’d never make any great discoveries. 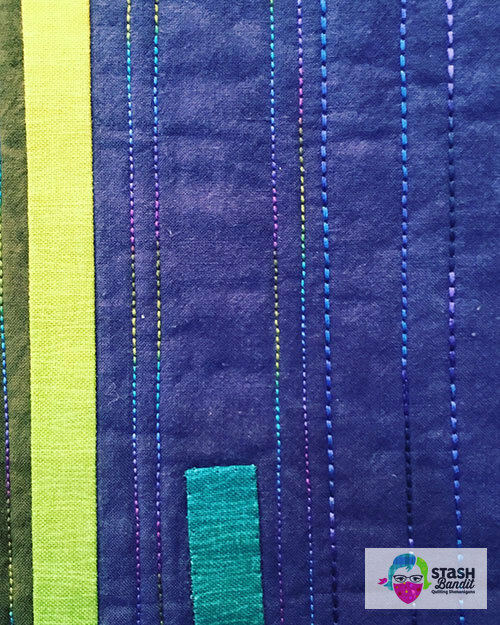 I finished the edges with a facing instead of a binding. It’s pretty easy to do and it’s a good skill to have in your bag of tricks. I wrote instructions for facing a quilt when I worked for Quiltmaker. They’re useful and they’re free! 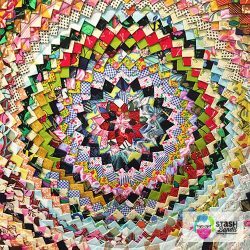 I’d love to bring One Hundred Small Quilts to your quilt group. Give me a call or shoot me an email. 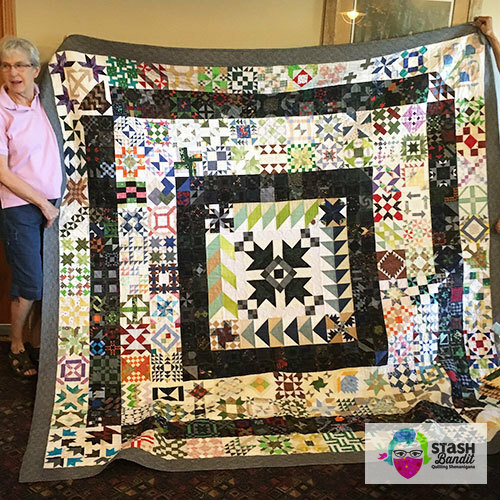 I taught a class in Shenandoah, Iowa last week, and my hostess treated me to the progress on her guild challenge quilt. It’s remarkable so I wanted to share it with you. She started by drawing these four fabrics randomly, and at first glance, you might think that was disheartening. Carolyn began with these four seemingly unrelated fabrics. But Carolyn is nothing if not an adventurer, and she soon found the common element. What do you think it was? My friends, the commonality among the fabrics was orange. And with that, Carolyn went to town. 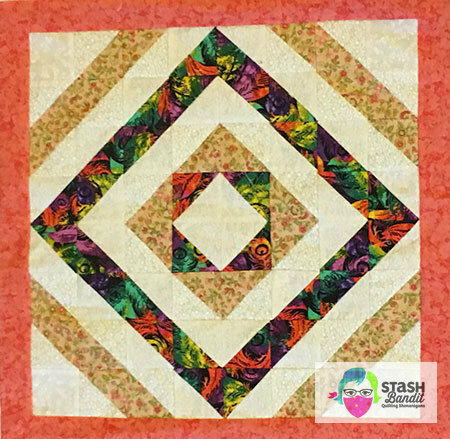 She made a medallion for the quilt’s center, repeating the fabrics several times to create cohesion. 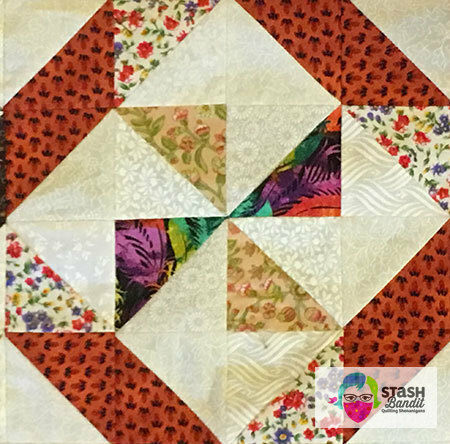 She made Pinwheels and framed them with triangle-squares. She added a little of this and a little of that, continuing to repeat the oranges and adding in some deep chocolate brown. Can you imagine how exciting it was to sew this? 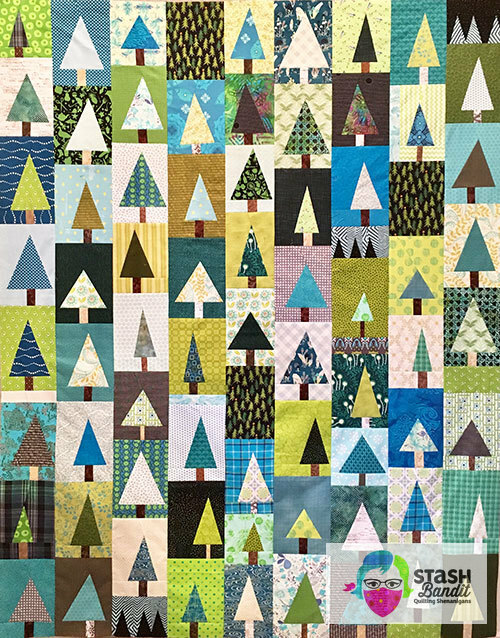 It’s the kind of quilt where you make decisions as you go. You don’t worry about the end result while you’re doing it. You just make one decision at a time. The quilt pulls you along. 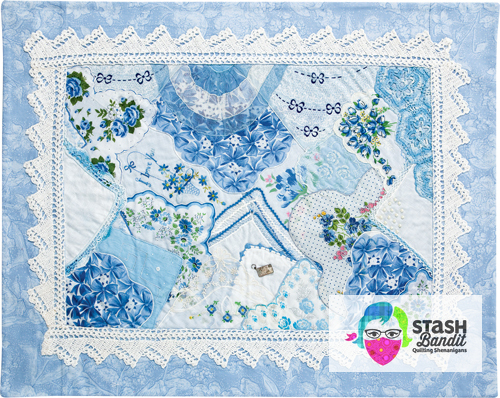 This is how the quilt looked when I visited at the beginning of April, but she’s not finished yet. More blocks will be added to the top and bottom, but knowing Carolyn, that plan could still change. It was great fun to hear about her process and to see how well this project is shaping up. I love it. 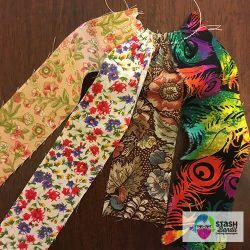 I don’t know if I could have made those four fabrics work this well! 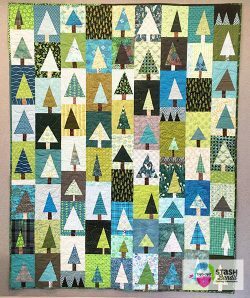 • Something has to tie a scrap quilt together. In this case, it was a variety of orange fabrics. • Make decisions as you go. No need to visualize the end result. Be along for the ride! 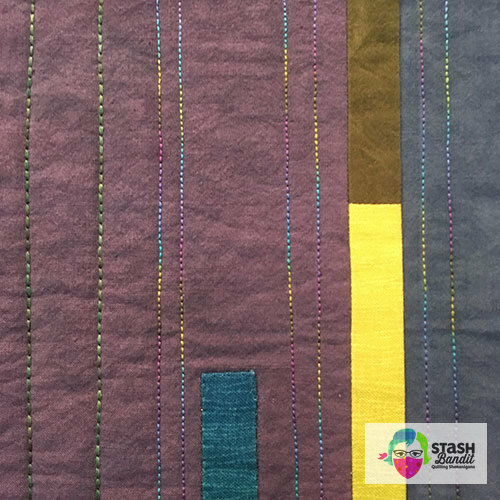 • Stand back to audition fabrics—way back, across the room, with the fabrics on a vertical surface. • Be brave. It’s only fabric. Thanks for all the inspiration, Carolyn! I had a wonderful time in Shenandoah. 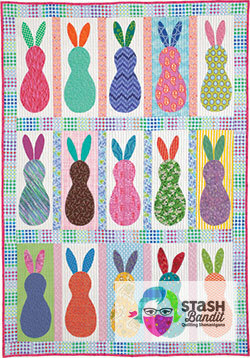 I always pull out Everybunny this time of year—it’s one of my favorite finishes. 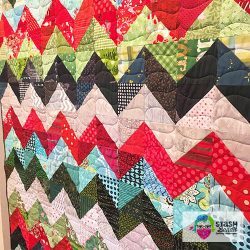 There was a lot to learn about scrap quilts when I made it. Let’s pull some lessons from it. 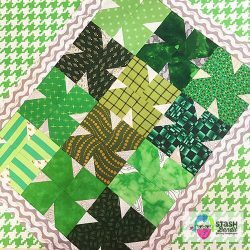 Today will be #1 and I’ll do a little series on making better scrap quilts. I’ve discovered that creativity needs to be fed. Creativity has an appetite. It can be more voracious at some times than others, but we shouldn’t ignore its need to be nurtured. Show and Tell can feed your creativity. This is Karen with her 365 finish at my retreat last fall. 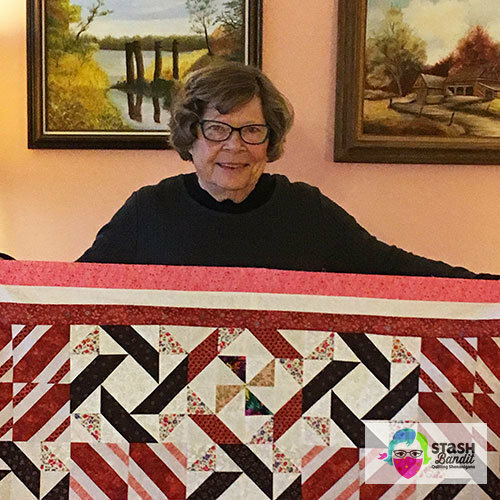 Here’s an example: You attend a quilt show or a guild meeting with show and tell. You see some quilts you love and you snap photos to help you remember. You’re inspired to start on something new or get back to something you put aside—all because you gave your creativity a hearty meal. Sound familiar? When you put “quilt” into the search field, interesting things pop up. 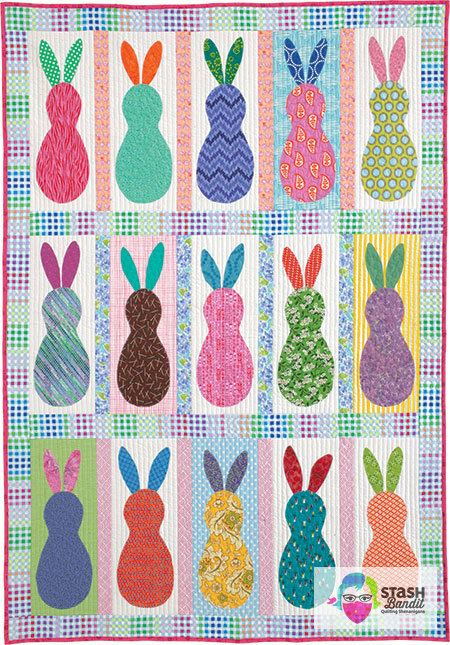 Take a peek at the British magazine Quilt Now. 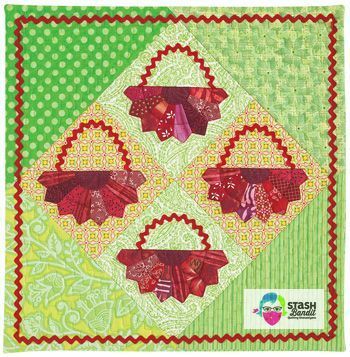 Search “quilts” and you get a completely different set of publications. 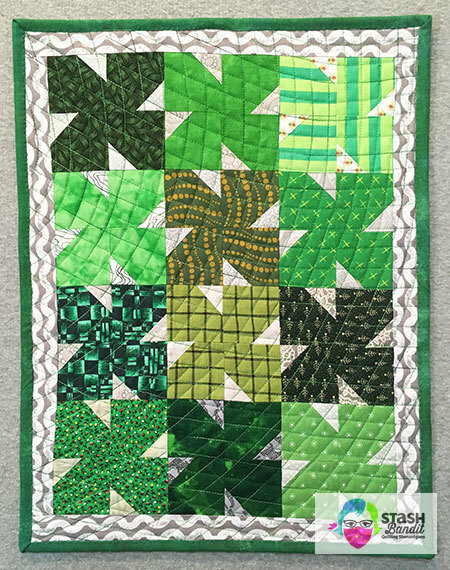 “Quilting” yields yet another batch. I love being able to peruse the pages with no commitment. I don’t have to buy or subscribe or give out my email. I just get to enjoy! 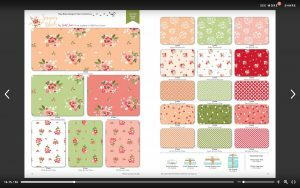 Some of the fabric companies publish their lookbooks on Issuu. 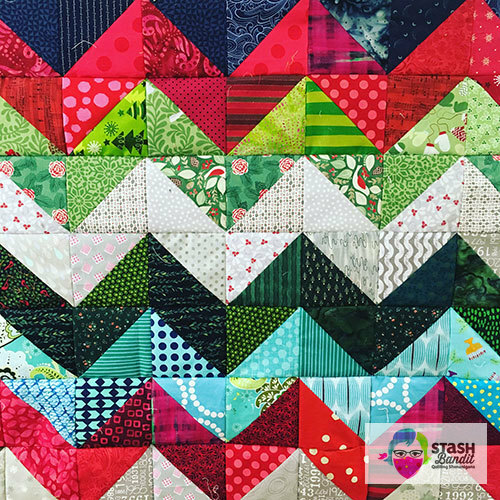 It’s a way to see what’s coming soon to local quilt shops. I’ve been enjoying catalogs from Riley Blake. There is so much variety. 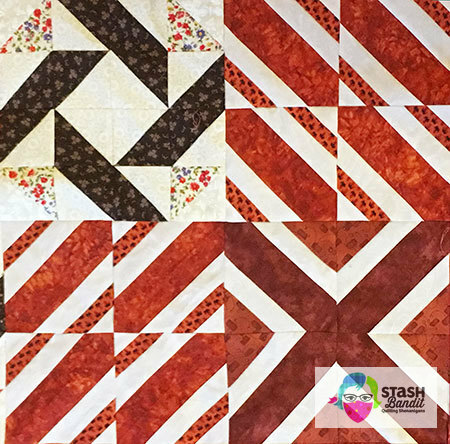 At the back of the lookbook are quilt pattern ideas from the designers, which are intended to show how the fabrics can be used effectively. There’s a lot to learn about color and value in those pages. 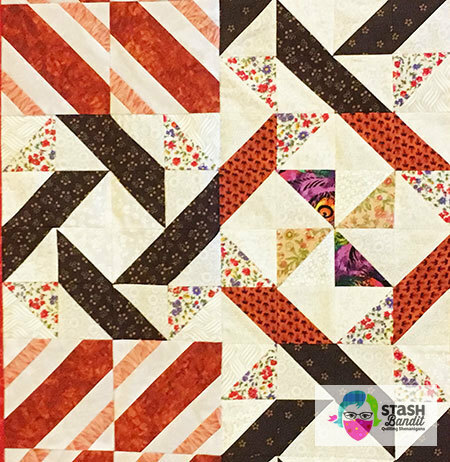 Pop over to issuu.com when you want to browse something quilty. A few years back I took a class from Jean Ayres on how to make old-fashioned Pine Burr blocks. Pine Burr quilt at Bellevue Arts Museum, 2012, by an African-American maker. 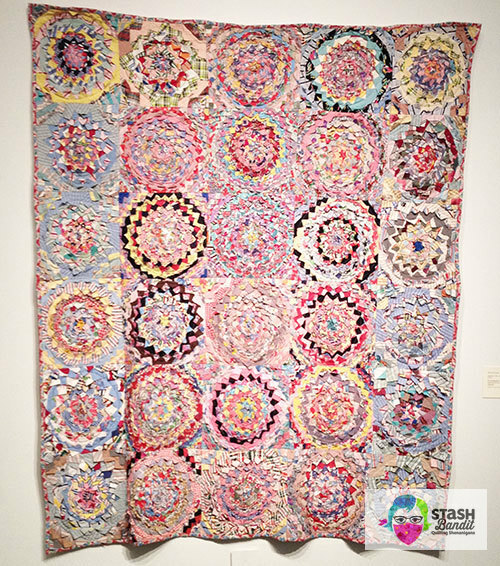 I’d seen a Pine Burr quilt in an exhibit of African-American quilts near Seattle at the Bellevue Arts Museum. I fell in love with it.